It’s also a reckless gambit to push Kiev’s madcap agenda for joining NATO and the European Union. No matter, it seems, if that gambit risks igniting a full-scale war between Russia and NATO. The US-led NATO military alliance and the European Union appeared to back Kiev’s claims of aggression by Moscow following the latest escalation in the Black Sea. That response fits Poroshenko’s long-held narrative of casting Russia as an aggressor and to mobilize support from NATO and the EU. Ironically, Western news media featured pro-NATO pundits who have claimed that the weekend confrontation was “vintage Putin”. It is speculated that the Russian president was taking advantage of several political distractions for Western governments – Trump’s public relations problems with Saudi Arabia over the murder of Jamal Khashoggi, the Brexit debacle and so on – to strike a heavy hand at Kiev. That typically cynical anti-Russian view completely overlooks the glaring facts that the naval clash between Ukrainian and Russian forces in the Black Sea plays conveniently for the Kiev regime and Poroshenko. It’s less a case of “vintage Putin” and more the dregs of Poroshenko’s intrigue. The prompt declaration by Poroshenko’s national security council for imposing martial law in Ukraine – within hours of the naval confrontation on Sunday – effectively strives to give Poroshenko and his Kiev regime dictatorial powers. Potentially, a state of emergency could permit Poroshenko to call off presidential elections due in March next year. With his poll ratings trailing at around 10 percent, it is looking very likely that the chocolate-tycoon-turned-politician is heading for a meltdown in the forthcoming election. If Poroshenko doesn’t actually call off the ballot, the ramping up of security drama may still allow him to rally voters around the flag and his leadership. Not only that, but if martial law is imposed it allows the Kiev regime to outlaw public protests, which had been growing out of popular discontent with corruption and social deprivation. The Kiev regime can also tighten its censorship of news media, impose dusk-to-dawn curfews and dragoon more men into military service. On Sunday, three Ukrainian navy warships were commandeered by Russian forces near the Kerch Strait in the Black Sea. The Russians claim that the Ukrainian vessels violated territorial limits, acted dangerously and ignored warnings to back off. The Ukrainian side claims that their vessels were in international waters trying to transport from Odessa via the Kerch Strait to the port of Mariupol on the Sea of Azov. Tensions have become particularly sharp since Russia opened a new bridge earlier this year over the Kerch Strait, linking its mainland with the Crimea Peninsula. Crimea seceded from Ukraine in March 2014 after a referendum on the peninsula called for joining the Russian Federation. That event is routinely referred in Western media to Russia’s “annexation” of Crimea. Such pejorative Western reports ignore the fact that Crimea’s popular mandate followed a CIA-backed coup d’état in Kiev by Neo-Nazis in February 2014 which illegally overthrew an elected government. The incumbent Ukrainian President Poroshenko owes his office to that violent putsch in Kiev. Several Kiev political and military figures have called for acts of sabotage against the $4 billion bridge over the Kerch Strait. That has in turn touched off Russia’s stepped-up security patrols in the area. 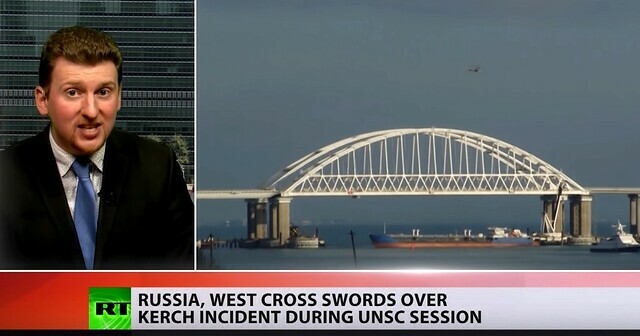 On the latest naval clash, Russia’s deputy foreign minister Grigory Karasin said it appeared to be a “premeditated provocation” by the Kiev regime. The swift suite of actions taken by Poroshenko do indeed suggest that the drama was following a script. In addition to wanting to impose martial law and all the dictatorial benefits that engenders, Poroshenko also called for Western governments to impose more anti-Russian sanctions, and for NATO partners to take action in “defense of Ukraine”. Kiev demanded that its three detained warships and over 20 crew members be returned immediately. Poroshenko asserted, somewhat unconvincingly, that any martial law regime would not be a “declaration of war” against Russia. He claimed that the Kiev regime was seeking to settle the nearly four-year conflict in eastern Ukraine through political means and in accordance with the Minsk 2014 and 2015 treaties. Poroshenko’s peacemaking rhetoric is acutely contradicted by the unremitting aggressive actions of his military forces towards the breakaway republics of Donetsk and Luhansk. Immediately following the naval showdown at the weekend, there were reports of Ukrainian forces launching heavy artillery attacks on Donetsk and incursions by assault drones across the truce line near Gorlovka. It seems significant that only three days before the naval clash in the Black Sea, President Poroshenko addressed the parliament in Kiev, saying that a constitutional amendment explicitly outlining his state’s plans to join NATO and the EU would be a final repudiation of Russia. Poroshenko declared that Moscow would not have a “veto” over Ukrainian aspirations to join the Western blocs. Russia has repeatedly warned that the bordering state of Ukraine joining NATO would be an unacceptable breach of its national security. Too, it appeared that both NATO and the EU had gone cool on Ukraine’s prospective membership owing to disturbing reports about systematic human rights violations, political corruption and the woeful state of its economy. The ever-petulant Poroshenko and his Neo-Nazi regime in Kiev are pushing confrontation with Russia in order to bolster their madcap plans to join NATO and the EU. And by buying into this latest provocation, it appears that NATO and the EU are drinking down the dregs that the Poroshenko regime is serving up. Russia’s president, Vladimir Putin, discussed the situation with German chancellor Angela Merkel by phone. Western countries have expressed serious concern over what’s happened. The UN Security Council held two emergency sessions – one requested by Russia, the other by Ukraine. The UN security council hold an emergency meeting in response to a tense standoff near Crimea involving a chase, gunfire, the seizure of Ukrainian vessels and the arrest of Ukrainian sailors. Meanwhile, Ukraine has declared martial law and placed its army on “full combat alert.” Will this lead to a deeper regional crisis? Then human rights professor Dan Kovalik joins News.Views. Hughes to argue that the US wants to use Ukraine as a “pawn” against Russia. RT Correspondent Alex Mihailovich gives us an update on the emergency UN Security Council meeting called to discuss this weekend’s dramatic events in the Kerch Strait. Ukrainian sailors, interviewed by Russia’s Federal Security Service (FSB) after the standoff near the Crimean coast in the Kerch Strait, admitted on camera in detention that they deliberately violated Russian borders. This entry was posted in Imperialism, Martial Law, Military, NATO, Politics, Russia and tagged Caleb T. Maupin, Crimea, European Union, Finian Cunningham, Hypocrisy, Kerch Strait, Petro Poroshenko, U.N. Security Council, Ukraine. Bookmark the permalink. ← William Blum: Be Nice To America. Or We’ll Bring Democracy To Your Country! If you believe the dumb-down, muddle-your-mind corporate media on the Ukraine, you are following a narrative that has strayed far from the truth. I appreciate the get-to-the-truth of the matter journalism of Finian Cunningham who reports on these dangerous and volatile developments in a way that we actually know what is happening. And I want to thank Dandelion Salad for your commitment to informing us instead of misleading us. Finian and I both thank you, peacevisionary.